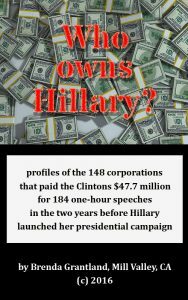 “Who Owns Hillary?” ebook is available here, now! My new ebook that I’ve been working on for months is finished, published, and available here only for download for a mere $3.99. Bill and Hillary Clinton were paid $47.7 million for 184 speeches in the two years immediately before Hillary officially declared her campaign for the presidency. This book focuses on the corporations that paid them between $225,000 and $750,000 for each speech, generally lasting one hour. These payments were not campaign contributions or even donations to the Clinton Foundation — but the same donors often contributed to those too. These speaking fees were paid directly to the Clintons – as personal income, to spend as they chose. The vast sums involved are not the only shockers. Some of the corporations that made the payments were deeply involved in numerous scandals and disasters including the real estate bubble, the derivatives bubble and the banking collapse – all creating the current recession, in which the bankers were bailed out but the people weren’t. Many of these corporations were not only too big to fail, but are near monopolies that grow ever larger by swallowing up the competition, and nobody tries to stop them. They have enjoyed very lax enforcement under the past few presidencies, and continually influence Congress and legislation by spending heavily on lobbying and contributing to political campaigns. Despite the damage they have done to individuals and the US and world economy, the executives that directed the risky and/or illegal behavior at these corporations did not go to prison. The corporations paid fines – often in the billions of dollars – and passed the costs on to the consumer. It became the cost of doing business.